India vs Australia, 3rd ODI: Live scores: Team India is eyeing a maiden bilateral One-Day International (ODI) series triumph on Australian soil. The Men in Blue have never won a bilateral ODI contest on Australian soil, and their only two series’ wins in this format have come in 1985 (World Championship of Cricket) and 2008 (CB Series). 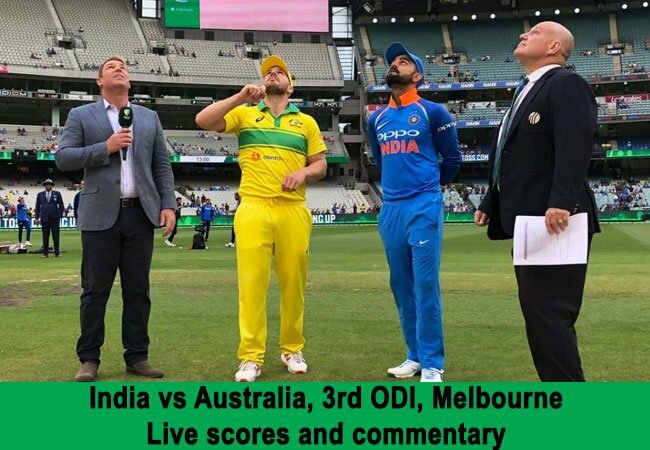 In the series decider third ODI between India and Australia, captain Kohli wins toss, opts to bowl at the iconic Melbourne Cricket Ground (MCG). India XI: Shikhar Dhawan, Rohit Sharma, Virat Kohli (c), Kedar Jadhav, Dinesh Karthik, MS Dhoni (wk), Vijay Shankar, Ravindra Jadeja, Yuzvendra Chahal, Bhuvneshwar Kumar, Mohammed Shami.Changes: Three changes for India as Yuzi, Jadhav and Shankar come in for Kuldeep, Rayudu and Siraj. Australia XI: Aaron Finch (c), Alex Carey (wk), Usman Khawaja, Shaun Marsh, Peter Handscomb, Marcus Stoinis, Glenn Maxwell, Jhye Richardson, Peter Siddle, Adam Zampa, Billy StanlakeChanges: The hosts had announced their XI on the eve of the match, like always. Zampa in for Lyon, while back soreness has ruled out fast bowler Behrendorff. Stanlake returns in place of the left-armer. After a bit delayed start, the play finally goes underway as Bhuvneshwar Kumar begins the proceedings for India. Two balls are bowled before the rain returns! The players are running off the field, the covers are being rushed in, super quick work from the ground staff, impressive! Play resumes at the MCG as the rain stops. Bhuvi continues his first over and we have a massive appeal just second ball after the rain break. The umpire is not interested maybe because of the height. Two balls later, Finch survives as his thick inside edge falls short of the first slip. He clearly is not in form and these rain breaks are not making his case any easier. Australia need their skipper to lead from the front today in the series decider, big test for Finch as a batsman. In the fifth ball of the third over, Bhuvi bowls a short ball to Alex Carey, who goes on the backfoot trying to defend it but ends up sending a thick outside edge to Kohli at the second slip. The Indian skipper dives forward to complete a low catch, great start for the visitors. Carey out for 5 off 11 balls and finch out for 14 off 24 balls.